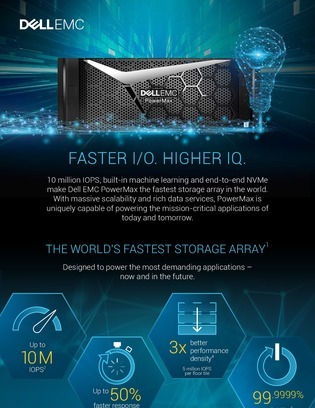 10 million IOPS, built-in machine learning for automatic I/O recognition, 3x better performance density, and end-to-end NVMe are just some of the many features that the Dell EMC PowerMax flash array powered by Intel® Xeon® processor boasts. If you’re looking to maximize your flash investment, keep reading. This graphic resource highlights Dell EMC PowerMax’s complete capabilities, and by accessing it here, you’ll discover the improvements this flash array can bring to your mission-critical applications.